Before I got into nursing school, I used to always tweet all of my complaints about the pre-reqs and competition, thinking that all of my #PreNursingProbs would magically go away when I got that magical acceptance letter. My name is Haley, and you may have seen me on Instagram or through the Medelita HIP Ambassador Program. I live in California and I am attending National University, where I’m currently in the accelerated bachelors of nursing program. I feel like I have found my calling and because I truly love what I do, I don’t mind the hard work. But, I still find plenty of #Probs throughout every class. I started my 22-month-long nursing program in April of 2016, and it is a little different than most. We do one class at a time, focusing on a single subject for two months at a time. Because of the accelerated curriculum, we also don’t take extended breaks, but we do get a week off every now and then and we got three weeks off for winter break. As exhausting as this is, it keeps us going. We don’t have the time off to lose our momentum or become distracted. As my 2018 graduation date approaches, I am still deciding on a specialty. I am someone who gets bored so easily and need to constantly be challenged, and my heart is definitely calling me to pediatrics and a critical care unit. 12 hours goes by really slow when you are caring for patients with less critical needs. 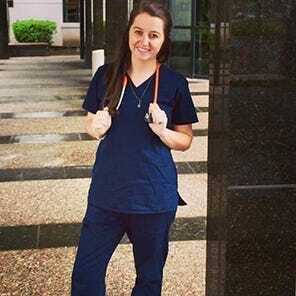 I hope to keep you all updated during my journey through the rest of my nursing program! I have had so many #Probs in my program and I am so excited to share them with you. I want to answer all of your #Probs and questions, whether it’s cohort drama, a bad professor, or even questions about getting into a program. I struggled to get into nursing school and this subject is so near and dear to my heart. All of these questions will be answered to the best of my ability and most of them will be based on my personal experiences. So if someone else has more to add, please definitely add your thoughts! I can’t wait to share all of my #NursingSchoolProbs with you and the Medelita family! I invite you to share all your #NursingSchoolProbs with me via Instagram (@Hales_elisabeth) as a message and I will get back to you as soon as I can. Medicine and teamwork go hand-in-hand, so let’s go through this journey together!